At TwirlyGirl, we believe clothing should be both functional and creative. This very unique girl's jacket is fully lined with contrasting, soft poly-charmeuse. 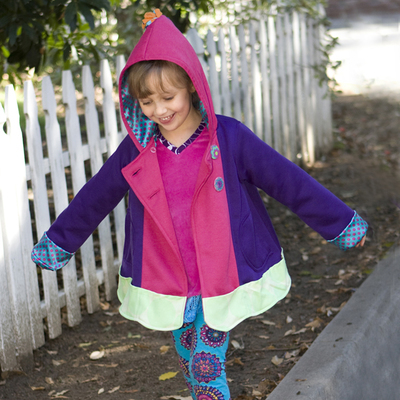 It’s layered in yummy fleece and has a hood with a handmade tassel. If that wasn't enough, we've added 11 small pockets around the bottom that she can use to collect important treasures. And while you may not think a discarded fuzzball or broken acorn is worth saving, your imaginative girl probably recognizes that it’s actually a priceless goodie. We encourage her creativity by giving her lots of pockets to store her precious finds of the day.